If your name was already taken the server will automatically assign you one, however you may ask any admin at rank Imp and above can be asked to change your name for you, we can do this once per character only. Saving your character is important! It does not save your progress as the server handles that however saving your character will create the character file that you need it to play your character! After you have successfully entered the game, your character is ready to be saved. Exit your character from the game at your leisure (perhaps after exploring) and re-open the client. Now click the client option to [save]. This will create a .moa file. It is recommended that you save it in the same folder as your game client, it will be easier to find it. Once a character is saved your free to create more characters by clicking on the [create character] option and re-entering new character details. Please note that Gods can re-send you any most or improperly saved .moa files but it is a long process and your identity needs to be verified by ip checking. If you have more than one character and you wish to switch to another character, you will have to load your character file. Click the [Load] button. Find the character file which you would like to play and load it. Heavily armored knights full of enthusiasm and valor. Unfortunately, the idea of magic escapes them. They can only master the simplest spells. Mighty spellcasters, but their fighting abilities will never match those of the Templars. Being both, fighters and magicians. The Templars are better fighters and the Harakim better magicians. But the combination of fighting skill and magic makes them dangerous enemies. Graphics update comes in image files format(.png). Or they may come in a zip file. It should contain the image files. To Update you have to unpack the graphics and place them into the "gfx" folder within the game folder directory that holds your client and other operating files. If the folder named "gfx" does not exist create one. Occasionally you may be asked to install a 'packed' update. This will be a zip file containing files with the following names; gx00.dat , gx00.idx , pnglib.dat , pnglib.idx. Unpack these files from the .zip and instead of placing them in a "gfx" folder copy them directly into the parent folder to 'override' the existing copies of these files at that location. Please do all updating before starting the client and not whilst the client is open and a live game is in process as this is the safest method. There is facility do do it "live" however by doing the above and then hitting the in-game "refresh" button which is hidden to discourage this. Please ask others where it is once you are experienced. Backpack, Equipment and Gold respectively. To move an item from your Backpack to your Equipment, hold down shift and click on the item. It will "stick" to your mouse cursor. Now move the cursor to it's destination. You'll notice that invalid slots are blocked (e.g. you cannot use shoes as weapon). Click again (still holding shift) on the slot you want and you've put the item there. To use an item in the Backpack or Equipment left click on it without holding shift,ctrl or alt. To look at an item, right click on it. The state of shift, ctrl and alt does not matter. Use the coins to take money from your inventory and drop it on the floor or to give it to another character. The coin buttons are 1S, 10S, 1G, 10G, 100G, 1,000G, 10,000G. To get the money back without dropping it, shift-click on your backpack. This is the chat window, you can left click in this field and start typing to chat to others. You can type/help here for a list of commands. Typing text and pressing [enter] says it to those in range. Typing /shout before your text and hitting [enter] shouts it to everyone online. Typing /tell [inserting player name] then your message before pressing [enter] whispers it to a player. Simply lists your 'modified' weapon value, armour value and experience. Section ten is a map of the places you have visited, blacked out areas represent unexplored parts of town. Section eleven is a simple compass which is handy in a variety of circumstances. Please note that to exit the game you must enter the back room of a 'tavern' your screen will go blank for a few seconds and your character will enter rest mode when the game exits. 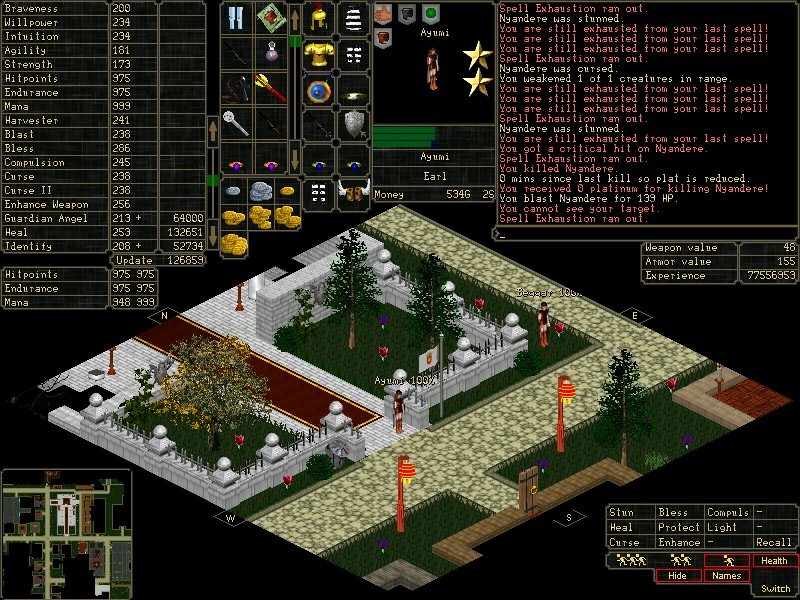 Walking without the auto-walk feature is done by left-clicking on the area of ground you wish to walk too. Shift+Left-click: take, drop, pickup, touch. Puts inventory items onto the cursor for use i.e to wear, to trash, to drop. Alt+Right click: look, read, get information from the environment such as signs. Look at players and see their avatar information by using it on them. /tell [player name] [player message] [enter]: send a private message to one player only. /time: will display in the chatbox Aranock game time. When your character is created, he should be in the Temple of Skua of Aranock. Everything is black, hidden. Take a step(left click on a square nearby) and everything will be shown. You have a Armor, a Weapon and 2 Gold in your purse. Prepare yourself for battle, get a full set of protection gears using your 2 Gold. You can buy the basic gears (Cloth Armors) from Ruth, she is in The Market. 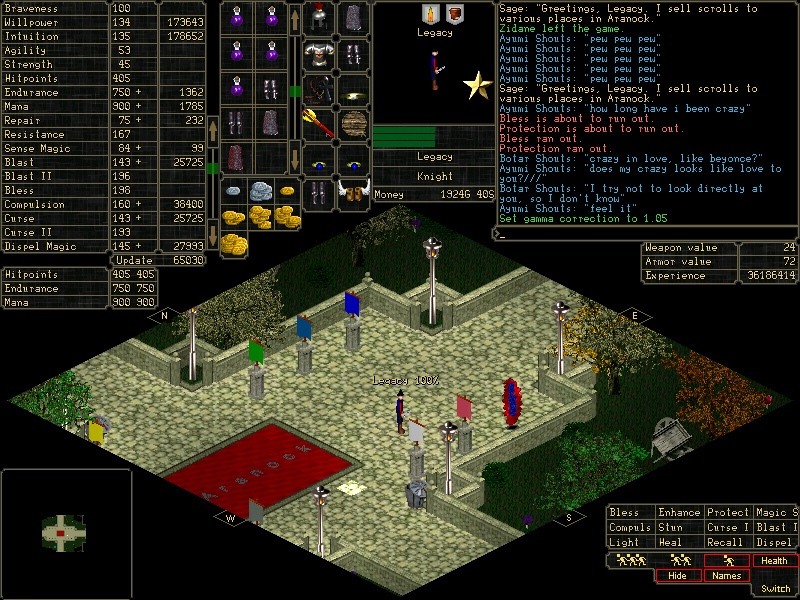 The Market is located just East of Temple of Skua. You should then head to Jamil's House to begin your very first quest. You will enter Aranock as a Mercenary, Harakim or Templar. Your game will start in the Temple of Aranock. There is a good chance that there will be some valuable stuff lying on the ground in the backroom. Take what you need. But do not take more. Other players will want to make use of these resources as well, and their need might be greater. Once you leave the Temple, you'll be in Aranock. There is a market, a tavern, several dungeons and NPC homes. Enter the backroom of the tavern to leave the game. Your character will "sleep" in safety while you're away and start again refreshed once you connect again. 36,133,300 Knight of Aranock Venture where no player has (yet) gone before!. When the chips are down and true heroes are needed, you will want to be here to save Aranock. 349,014,500 Baron of Aranock Venture where no player has (yet) gone before!. When the chips are down and true heroes are needed, you will want to be here to save Aranock. 63,000,600 Earl of Aranock Venture where no player has (yet) gone before!. When the chips are down and true heroes are needed, you will want to be here to save Aranock. 80,977,100 Warlord of Aranock Venture where no player has (yet) gone before!. When the chips are down and true heroes are needed, you will want to be here to save Aranock. Flowers and flasks can make certain types of potions. To make a potion, take(shift + left click) the ingredient On Hand, then use(left click) on the Empty Bottle. 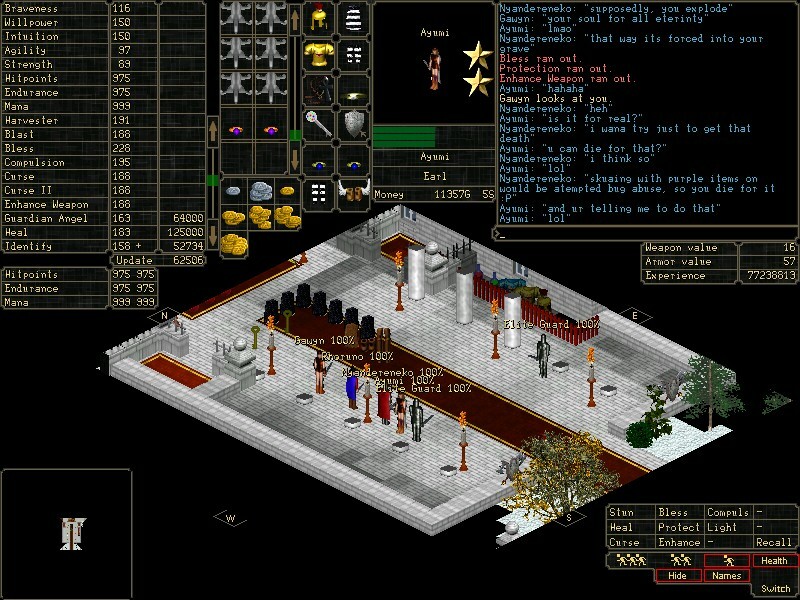 If you meet a merchant, look at him (alt right click) to open a shop window. Once the window is open, drop items in it to sell them (shift click on the item in your inventory, then click in the shop window). You can look at items in the shop by right clicking on them. To buy something, left click on it. You can close the shop window by clicking on the X in the top left corner of the shop window or by pressing ESCape. The default target for a friendly spell is yourself. The default target for an offensive spell is the enemy attacking you. To target someone else you have to [alt+left-click] on them until they are highlighted green. Before you decide to attack somebody, there are some rules to know: Whatever you do will affect your alignment. Killing good people makes you bad and vice versa. Be especially careful in town: It is a very evil act to kill a shopkeeper and this will have a very adverse effect on your luck. If you are saved by the Gods, you will be snatched out of danger and deposited, complete with your equipment and money, in the Temple of Aranock. You will lose a lot of your luck, so it becomes less likely that you will be saved again. If you are not saved, then you will die and a grave will appear at the location of your death, and your equipment and money will be in the grave. Your body will re-incarnate, unclothed and empty-handed, in the Temple of Aranock. If you manage to reach your grave within 15 minutes, you can retrieve your possessions. Your death also causes the loss of 10% of any hit points you may have previously gained from experience. As a Purple(in game name), you can Pvp(Player vs Player), with another Purple, almost everywhere in the Game unless the fight occurs in fake death area like Arena, Purple fights are Real Death. Real Death is similar to getting killed by a monster. There is a chance where your grave will appear with all your items inside it. Type /who, the Player Names with a " * " after their names are Purples. Their location are not displayed in the list. Luck is a measure of how well you are liked by the Gods. Luck helps determine if the Gods save you from otherwise certain death in battle, and many other things as well. Your luck gets used up if the Gods save you, and deteriorates if you perform evil acts, such as killing good NPCs, or anger the gods in some other way. You can improve your luck by making generous offerings to the gods at their altars in the Temple of Aranock and elsewhere. The Gods' idea of a generous offer depends on your rank, so don't be surprised if the pittance you gave as a private angers them coming from a Captain. You will find out how the Gods are inclined to you when you make a donation. If they are pleased with you (not just your last offer! ), they will save you in need. When you first start playing, the Gods give you the benefit of the doubt and grant you enough Luck for two salvations from death. If you use up this divine favor, staying on good terms with them is up to you. There is a code of conduct in the Labrinth that can be read in our terms and conditions section. Base Attribute, used by almost all skills and spells. Base Attribute, used by all spells. Base Attribute, used by most fighting skills, also increases speed (movement and fighting). Required minimum for weapons and armor. ase Attribute, used by all fighting skills, also increases speed and damage done when fighting. Required minimum for weapons and armor. A full list of skills will be made available soon.